Kim Jerantowski tries to avoid defenders. 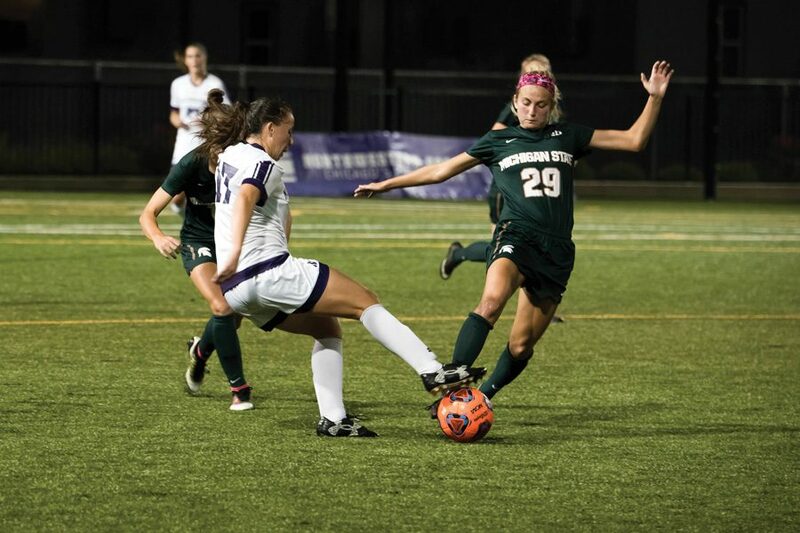 The junior midfielder had two shots off the bench for Northwestern, which topped No. 19 Michigan in an emotional battle in Evanston on Sunday. From the opening minutes of the Wildcats’ conference battle against Michigan, Northwestern had a target on its back. Despite falling twice to the Wolverines last season, NU earned a bid to the NCAA Tournament over Michigan, and the No. 19 Wolverines entered the contest eyeing revenge. But the Cats, (12-1-1, 5-1-1 Big Ten) who had not beaten the Wolverines (9-3-1, 5-2-0 Big Ten) since 2011, had a bone to pick too. And after an emotional back-and-forth contest, NU pulled away with the 2-1 victory. Michigan surged out of the gate, dominating possession and putting Cats’ goalie Lauren Clem on the defensive early. Clem held her own, and after entering the half tied 1-1, the Cats emerged in the second with superior passion, controlling the game’s pace and defending well after scoring a second goal in the 49th minute. Despite opening with a barrage of shots on goal, the Wolverines actually ceded the first score of the contest. Sophomore midfielder Michele Chernesky scored on a deflection off a free kick in the 15th minute to give NU a cushion. Michigan responded four minutes later with a penalty kick goal to tie the game. The Wolverines continued to control the tempo for the remainder of the first half, but Clem — who would eventually finish with a career-high 11 saves — kept Michigan from pulling ahead. When the second half began, the Cats flipped the narrative. After surviving the Wolverines at their best, NU refused to let the opportunity to make a statement win slip away. Just five minutes into the period, Erikson attempted a deep cross, which Michigan’s goalie Sarah Jackson fumbled. Sophomore midfielder Olivia Korhonen took advantage of Jackson’s mistake and headed in the go-ahead goal. The score was her first of the season — as was Chernesky’s. With top-scorer forward Brenna Lovera awaiting surgery for a torn ACL, per Coach Michael Moynihan, production from new sources proved key. “When we have this many of our attacking players out right now — prominent ones — to have people continuously stepping up, it’s very encouraging,” he said. The win puts NU on track to accomplish its goal of winning the Big Ten. The Cats had already proved themselves against a number of opponents, but Michigan was perhaps the biggest roadblock they faced this season. And with the victory, NU not only proved itself to the Wolverines, but also to the rest of the country.